Please Note: this offer is now over. Have a look at our News page to find any current offers. This April, get free accessories with every DPA d:screet™ Miniature Lavalier microphone. 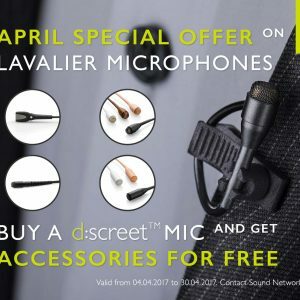 Buy an omnidirectional d:screet™ Lavalier Microphone between 4th-30th of April 2017 and get the new, versatile DPA SCM0013-B lavalier clip, a foam windscreen and an adapter for your chosen wireless system for free. This could save you up to 30%! Which DPA d:screet™ Mics are included? What’s in the accessory pack? How do I claim my free accessories? Buy any of the mics included in the campaign within the campaign period from an authorised DPA Microphones dealer in the UK or Ireland and ask them for your free accessory pack. You will need to specify which wireless adapter you want. No problem – just give us a call on +44(0)20 3008 7530 or send an email to [email protected]. We’ll get you sorted in no time.